Earlier today, the Honorable Kirsty Duncan, Minister of Science, announced over $173 million in funding for 203 new and renewed Canada Research Chairs at universities across Canada. Sixteen CRCs went to McGill faculty. 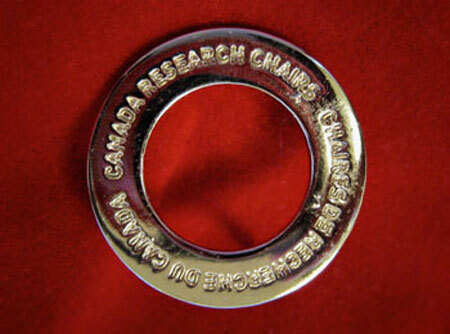 The distinctive pin awarded all Canada Research Chairs. On Friday, Dec. 2, the Honorable Kirsty Duncan, Minister of Science, announced over $173 million in funding for 203 new and renewed Canada Research Chairs at universities across Canada. Sixteen CRCs went to McGill faculty. Eleven of McGill’s new CRCs went to women, which reflects the national trend; this cohort is among the highest percentage of women ever, at 38 per cent. CRCs are granted to outstanding researchers acknowledged by their peers as world leaders in their fields. The CRC program was created to enable Canadian universities to attract and retain established and emerging world-class researchers. McGill research projects to be supported by this new round of CRC funding range from studies in artificial intelligence to social justice articulated through architecture to the emergence of systems of land tenure in New France, New Spain and New England. There are two types of Canada Research Chairs. Tier 1 Chairs are tenable for seven years and renewable. Each Tier 1 Chair is valued at $200,000 annually. Tier 2 Chairs, valued at $100,000 annually for five years with one opportunity for renewal, are for exceptional emerging researchers, acknowledged by their peers as having the potential to lead in their field. Seven new Tier 2 Chairs and four new Tier 1 Chairs were granted to McGill researchers in this round. Five McGill researchers were granted renewals on their Tier 1 and Tier 2 awards. The full McGill’s newest CRCs is below.